Today as I was driving across Vermont I saw a lot of milkweed seeds floating in the breeze. These were the first I had noticed this year, maybe more because I haven’t been spending much time in open fields than because this was the first day they’ve been dispersing. For the past couple of weeks, though, I’ve been seeing some much smaller bits of white fluff drifting by me on my walks in the woods. These are woolly aphids (Eriosomatinae), whose bodies are covered with white, waxy filaments. The reason aphids are on the move in the fall is that they are migrating to new host plants. Many aphid species use one kind of plant for part of the year and another kind of plant for the rest. For instance, the two species that make galls on witch hazel (one of which I showed in my last post) both live on birch leaves for part of their life cycle. The general story for aphids with alternating hosts is something like this: In the fall, eggs are laid on bark of the primary host, where they overwinter. These are an important food source for chickadees and other bark-gleaning birds. The aphids that hatch from eggs in the spring are called fundatrices; they are all female and are parthenogenetic (they don’t mate) and viviparous (give birth to live young rather than laying eggs). Their offspring are likewise all female, parthenogenetic, and viviparous, but are called fundatrigeniae or virginoparae, as are the members of the subsequent generations through the summer. (I could explain this without all the terminology, but any time you read about aphids you will encounter these terms, so I’m including them here in the hope that it will help us all keep them straight.) Sometime in the spring, alatae (winged adults, as opposed to apterae, the wingless ones) take off in search of the secondary host, which is often an herbaceous plant. Parthenogenetic reproduction continues on the secondary host until the fall, when winged adults called sexuparae arise and return to the primary host. Here, they give birth to sexuales, a generation of males and females, which reproduce sexually. After mating, the female sexuales lay eggs, completing the cycle. 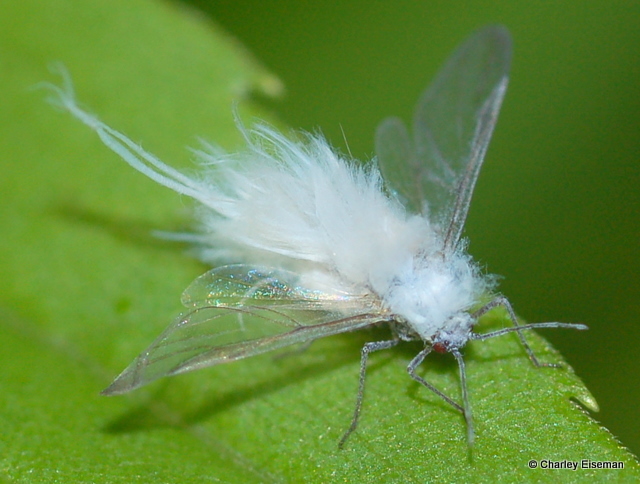 So the little bits of fluff floating through the woods are woolly aphid sexuparae. It’s possible that they belong to a species of Eriosoma, in which case they are looking for elm trees, leaving behind (depending on which species of Eriosoma) a shadbush, hawthorn, or apple, their descendants destined to distort elm leaves in the spring. But there are 22 other genera of woolly aphids (as in Eriosomatinae; a number of other aphid subfamilies also have species that are woolly) in North America, and for all I know some of them look just like Eriosoma. Incidentally, in reviewing my woolly aphid photos for this post, I came across some I took this spring of one on the underside of a hackberry leaf. When I took the photos, I didn’t think that hackberry was necessarily the host plant, but I now see that the aphid was in the process of depositing nymphs. 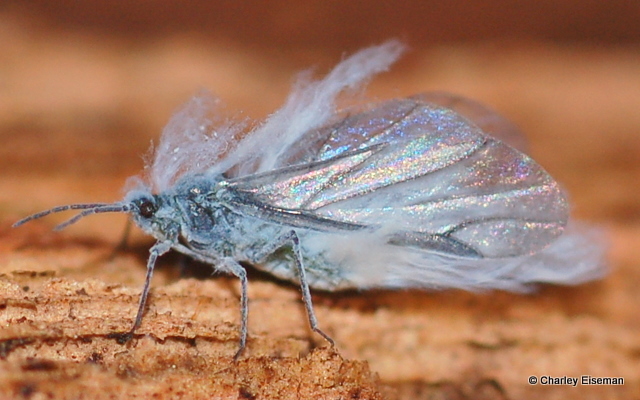 As far as I can tell, the only woolly aphid in the world known to feed on hackberry is Shivaphis celti, the Asian woolly hackberry aphid, which this clearly is not (it lacks the banded antennae and patterned wings, among other things). I wonder if this is an elm-feeding species that messed up (hackberry being in the same family as elm), or something new to science… if I come across these again, I’ll have to investigate further. 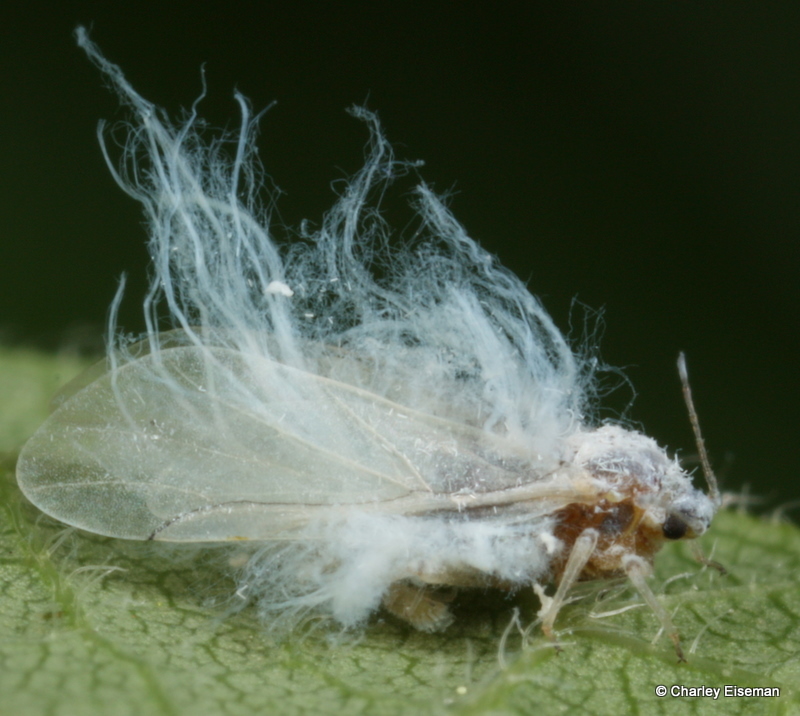 Look closely and you'll see a nymph lying on its back under this woolly aphid on a hackberry leaf. This shot shows a nymph in the lower right corner. The nymph from the previous shot is still under her mother but is more obscured. 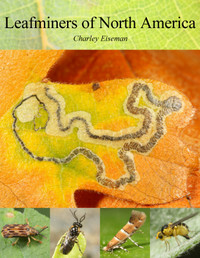 My go-to reference for aphid information is this website, where Roger Blackman and Victor Eastop are generously providing the content from their extremely expensive books. I am a freelance naturalist, endlessly fascinated by the interconnections of all the living and nonliving things around me. 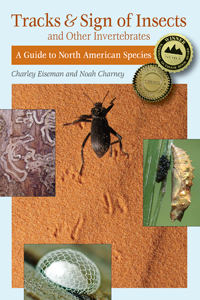 I am the lead author of Tracks & Sign of Insects and Other Invertebrates (Stackpole Books, 2010), and continue to collect photographs and information on this subject. These days I am especially drawn to galls, leaf mines, and other plant-insect interactions. 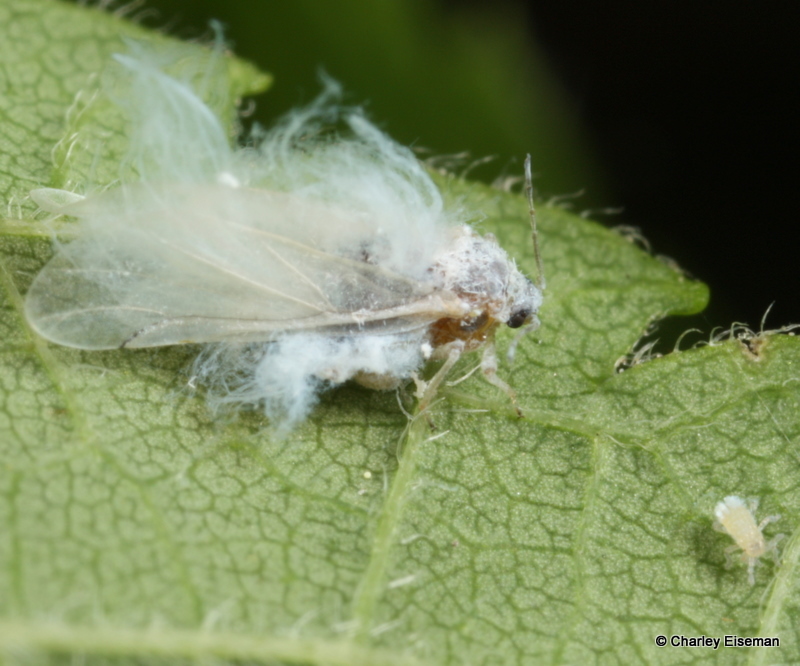 This entry was posted in Uncategorized and tagged aphid, Eriosomatinae, woolly aphid. Bookmark the permalink. I had no idea aphids could be so cute. I love the world that a macro lens can reveal. Time to look even closer at the world around me. Thank you! I’ve never seen these critters before – great pictures! True story: when I was an undergrad (pre-any entomology courses), an instructor sent us neonate biology students on a nature scavenger hunt. One of the items to be collected was woolly aphids. I found something fuzzy on a tree and brought her that – turned out to be gypsy moth eggs – oops. thank you for this info. i have just seen these tiny critters last night for the first time. Your photos are wonderfully fabulous! In Melbourne, Australia i have an apple tree laden with massed woolly aphids. I’m wondering if they are prey/hosts to the usual predators/parasites of aphids, or does the “wool” make them less palatable/accessible? Thanks – such awesome work! Well, I just searched the woolly aphid genus Eriosoma here, and the list of known parasites is pretty short. I have no idea whether this is because there are few parasitoids, or because no one has spent much time studying this question, but one would think that the aphids on apple trees have been studied well. In North America we have a butterfly caterpillar called the “harvester,” which specializes in eating woolly aphids. The larva of a species of green lacewing has been observed preying on woolly aphids and then camouflaging itself with their “wool.” So whatever protection the wax provides evidently isn’t enough to keep everyone away! Cool thanks. Gotta love those little crocodilian lacewing larvae, and their macabre camouflage gig! I notice you did a PDC, Charley. I came to your site looking up IPM for our garden – it’s fabulous.